We’d love your help. Let us know what’s wrong with this preview of Academic Exercises by K.J. Parker. Academic Exercises is the first collection of shorter work by master novelist K.J. Parker, and it is a stunner. 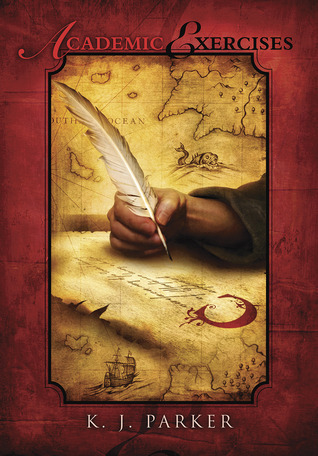 Weighing in at over 500 pages, this generous volume gathers together thirteen highly distinctive stories, essays, and novellas, including the recent World Fantasy Award-Winner, “Let Maps to Others”. The result is a significant publishing event, a book that belong Academic Exercises is the first collection of shorter work by master novelist K.J. Parker, and it is a stunner. Weighing in at over 500 pages, this generous volume gathers together thirteen highly distinctive stories, essays, and novellas, including the recent World Fantasy Award-Winner, “Let Maps to Others”. The result is a significant publishing event, a book that belongs on the shelf of every serious reader of imaginative fiction. The collection opens with the World Fantasy Award-winning “A Small Price to Pay for Birdsong”, a story of music and murder set against a complex mentor/pupil relationship, and closes with the superb novella “Blue & Gold”, which features what may be the most beguiling opening lines in recent memory. In between, Parker has assembled a treasure house of narrative pleasures. In “A Rich, Full Week”, an itinerant “wizard” undergoes a transformative encounter with a member of the “restless dead.” “Purple & Black”, the longest story in the book, is an epistolary tale about a man who inherits the most hazardous position imaginable: Emperor. “Amor Vincit Omnia” recounts a confrontation with a mass murderer who may have mastered an impossible form of magic. Rounding out the volume — and enriching it enormously — are three fascinating and illuminating essays that bear direct relevance to Parker’s unique brand of fiction: “On Sieges”, “Cutting Edge Technology”, and “Rich Men’s Skins”. To ask other readers questions about Academic Exercises, please sign up. This anthology shows that a true storyteller succeeds no matter what the length of the story is. Each of the works of fiction is a Lehrstunde of the art of the narrative. What have we got h If you're into stuff like this, you can read the full review. Loved just as much if not more, the second time around! An adept is sent out by the Brotherhood to investigate and deal with a report of a village plagued by an undead. It's not an unusual assignment for one in his position, but it is his first time dealing with this specific kind of problem. Excellent characterization & thoughtfulness elevates this a good step above most tales with a 'vampire-hunter confronts monster' theme. Re-read; previously read in Strahan's 2011 'Year's Best' anthology, when I said, "A very classic fantasy tale of power struggles amongst wizards. It's also very good; I loved the conclusion." The idea of the story is summed up in this quote, "If a man exists who is immune to force, even if he's the most blameless anchorite living on top of a column in the middle of the desert, he is beyond government, beyond authority, and cannot be controlled; and that would be intolerable." The wizards in this story have all kinds of spells which can be used as terrible weapons - but they have never been able to discover a universal defense. They argue about whether such a thing is even possible, But now, an untrained, wild talent is rumored to have discovered the secret. And the wild talent is no peaceful hermit, but a mad killer. Brother Framea is sent to investigate. Along the way, as Parker loves to do, there's quite a lot of commentary of the subjects of ethics and corruptibility. Informative essay on the history of siege warfare. "Another excellent short story by Parker, which makes me pleased that I ordered two books from this author since reading "A Small Price to Pay for Birdsong." This is similar in feel There are really two parts to this story - the first explores academic competition and one-upmanship, taken to a disturbing level. The second, following from the results of the first, probes literal exploration, and the consequences of obsession - with a heaping dose of irony." A wizard-scholar who's, shall we say, not the most successful graduate that the Studium has churned out, is given an unenviable assignment: he has to check a large number of dogs for the unlikely signs of demonic possession, before the animals can legally be cleared for sale. Not only is this an onerous, tedious, and near-pointless task, he has to also train a junior student how to do the job, meaning he can't even slack off. Extremely interesting and entertaining essay on the history of swordmaking and the techniques of swordfighting. On assignment, instructed only to "investigate," an arrogant, chauvinistic wizard and his junior assistant are looking into a remote, abandoned tower. It looks like this tower was inhabited, not terribly long ago, by a rogue wizard. From the evidence found in a difficult-to-decipher manuscript, it looks like this wizard, in a situation eerily mirroring that of the investigators', also had a talented but inexperienced female trainee. And his experiments with new spells may have been less than ethical. And somehow, along the way, the story twists from an entertainingly gossipy glimpse into the politics of empire, into a musing on the nature of power and the fate of idealism. Excellently done. An essay on the history of armor. A good companion to the previous essay on swordsmithing. I really enjoy KJ Parker's style. This is a fun and irony-filled tale of a group of dissipated young men who decide to start a new religion as a way to jump-start their cash flow. However, when the scheme succeeds past their wildest dreams, the joke might end up being on them - or on the world at large. Our protagonist is a graduate from the Studium (KJ Parker's school for wizards [or maybe scientists], which is a recurring feature in his fiction), but has barely scraped through graduation by the skin of his teeth. He's simply unable to master many of the expected skills, and is certainly not going to get a job placement. His advisor counsels him to go into another field - a non-magical one. The arts maybe, or accounting. Naturally, our narrator is disappointed. Were his years of study wasted? Nevertheless, he seems to take his advisor's advice, and goes into painting religious icons. But, he didn't actually graduate from the Studium without learning anything. He's got a "cheat" - a forbidden spell. As his fame and fortune grows, one would think he'd managed to grasp the best of both worlds. But there's always a catch, isn't there? KJ Parker revisited the character of Saloninus, introduced here, in 'The Devil You Know,' which I read a few months ago. I understand why - it's a great character! (Imagine if Leonardo da Vinci had been an amoral conman and alchemist?) If you've read either one, some of the details here will be familiar to you.I did think that 'The Devil You Know' was slightly better, but this one was great too. KJ Parker's wry cynicism regarding human nature is on display in top form, in this story. The narrator tells you upfront that he's unreliable: a liar, a criminal, and not to be trusted. He also tells us that he discovered the secret of transmuting base metals to gold, and that he murdered his wife. Should we believe either of these things? Academic Exercises is a collection of mostly short stories & novelettes, all apparently set in the same alternate world (which seems quite like the Renaissance Italian city state era.) Many of the stories involve magic that is not magic, just science that isn't entirely understood yet. A couple of stories leave the magic out altogether. Most of them also involve a institution of study of learning known as the Studium, which can teach magic among other things. And there are also a couple of f Academic Exercises is a collection of mostly short stories & novelettes, all apparently set in the same alternate world (which seems quite like the Renaissance Italian city state era.) Many of the stories involve magic that is not magic, just science that isn't entirely understood yet. A couple of stories leave the magic out altogether. Most of them also involve a institution of study of learning known as the Studium, which can teach magic among other things. And there are also a couple of fantasy-related non-fiction articles. Overall, this collection was an entertaining read throughout. Many of the best stories actually had no use of magic in them at all, but we're just about people in slightly different world of ours. The protagonist and narrator is a marginal graduate of the Studium, 207th from a class of 220, and is appropriately humble and makes a sympathetic character. I found his self-effacing mental narration entertaining. it's a decent start to the collection, because it provides a little explanation of the Studium, the world in which it exists, and a little bit about how it's fairly low-powered magic works. A good start with this collection with a World Fantasy Award winner. I thought this was a splendid story! It drew me in from the start, all the while wondering why I found it so compelling. It's not really a work of fantasy as I usually think of it. It's set in an apparently fictional country, but it could quite easily have been dropped into a Renaissance Italian city state without much effort. Two composers, a little like Salieri and Mozart in Amadeus, one, the professor, wanting desperately to succeed and the other, Subtilius, gentleman scoundrel, producing genius effortlessly. The story narration is provided by the professor (who I don't think is ever given a name?) He hates himself for his own inability to rise to that of his former pupil, and he also hates himself because he recognizes how he can be self-serving, so easy to tempt. He has quite natural flaws, the way he wrestles with his conscience... and sometimes wins. His recognition of those flaws makes him a quite sympathetic narrator. I loved the writing, moving forward effortlessly with some really lovely turns of phrase. ("Segibert could best be described as a series of brief intervals between drinks.") And I liked the way the characters were so scrupulously polite to each other. "...like a duke scattering coins to the crowd from a balcony. Of course, the old duke used to have the coins heated in a brazier first." "In the old duke’s time, they used to punish traitors by shutting them up in a cage with a lion. As an exquisite refinement of malice, they used to feed the lion to bursting point first. That way, it wasn’t hungry again for the best part of a day." "The old duke used to punish debtors by giving them a head start and then turning his wolfhounds loose." A battle between wizards, one a practitioner from the prestigious Studium, and the other a natural, wild talent gone rogue. The narration is spot on, though Parker uses 3rd person for the first and ony time in this collection. Parker leavens the story with a good deal of humor early on, then switches to a slightly grimmer mood by the end. And as with the previous stories, everyone seems quite polite and talkative, even when they're trying to kill each other. This shares a similar thought to Birdsong: the assertion that raw, natural talent is better than lots of training: "An untrained might well succeed where an adept would fail, because the untrained often possess a degree of intuitive power that tends to atrophy during the course of formal education." And yet the victor doesn't escape unscathed. As Ben commented, all the characters here are flawed in one way or another, and Parker has a couple of nice twists to throw at the protagonist and narrator. This is the first story that isn't available free somewhere online. It's also the first story that attempts to explain the "science" of the "not magic just science we don't understand yet" powers that are manifested in a couple of other stories. Again there is a student/teacher relationship, with a young woman who doesn't understand the "rooms" used in much of the magic. (In a couple of the previous stories, practitioners have alluded to the "entering the 3rd room" or some other such number.) So naturally, our protagonist needs to explain it, "Rooms for Dummies" style. I actually thought the story, which is relatively short compared to the other stories as well, suffered from the extra exposition (even though they were part of the teaching that was inherent in the story.) Interesting plot, though. Another excellent story, this one set in the same world (I think) but well before the others. It explains the origin of the religion of the "Invincible Sun", the organized, apparently dominant religion of the land in previous stories, though only referenced obliquely. A couple of ne'er-do-wells hatch a plan to get rich by inventing their own religion. And then things spiral well beyond their plans and control. It does have that wry sense of humor and a flexible cynicism. It put me in mind of Kipling's "The Man Who Would Be King" type of adventure story. "I have no problem with women. Bearing in mind the disadvantages they suffer from, many of them do remarkably well." The story is a little reminiscent of those Russian nesting dolls; there's a bit of recursion going on. The moral to the story this time is that teachers aren't always as wise as they think they are. i think this story would have worked a little better if the main character had been a little more sympathetic, perhaps? Interesting story of a failed Studium "wizard" who, after flunking out of wizard school this forced to look for a job in the private sector. What does a dropout do after training for years in a field he can't get a job? Apparently, one becomes an artist. Despite the usual prohibitions, he decides to "cheat" by using some illicit "magic tricks" he learned at school. But that cheating isn't as simple as it seems. The story works pretty well, displays Parker's usual wry sense of humor, and once again gives the protagonist/narrator an interesting comeuppance. Fantasy and non-fiction seem almost contradictions:) I found these related non-fiction articles interesting, though the subject matter is more ancillary than with science fiction. In science fiction, everybody uses the same science (at least until they get to the fiction part); but in fantasy, everyone's entitled to their own magic/supernatural interpretation. You can write an article about the history of elves in European folklore, but you can't actually insist any particular fantasy writer sticks to any of it. While you can write about medieval European armor, weapons, or warfare, because so many authors use the faux-European medieval setting, even there fantasy authors don't have to accurately reflect actual history. On Sieges is the first of the non-fiction articles. It briefly outlines siege techniques through history up through World War I, mostly centered on Europe. It's interesting enough, though as I mentioned before, sword and sorcery isn't necessarily historical fiction. Still, as I recall there was a fairly lengthy siege in , e.g., The Dragonbone Chair, a fairly low-magic sword and sorcery novel, as well as a couple in The Lord of the Rings. "I explained how such guns were made to one of the best blacksmiths in Europe and he didn’t believe me; not possible, he said, you couldn’t get that much metal up to an even welding heat, and even if you could, you wouldn’t have enough time to form sound welds. As for heating up the bands and then shrinking them onto the barrel, forget it. Too much heat, not enough time. Couldn’t be done. But it was, and the welded-and-hooped cannon made rubble out of walls that had defied assault for centuries." That's a pretty bold assertion by Parker without citations. Parker's identity is a bit of a mystery. This suggests s/he's at least a pretty dedicated amateur historian. Cutting Edge Technology offers a similar non-fiction article on the history of swords and sword making and sword fighting techniques, both in Europe and Arabia, India and Japan. A few interesting takeaways, and some notes in the back explaining some alternate views of other historians. Rich Men’s Skins is a matching nonfiction article on the history of armor, mostly in Europe. The text collects a variety of Parker’s short fiction; some of it has been available before in the form of novell K.J. Parker is an author whose prose I’ve always enjoyed; on the other hand, nobody else ever seems to have read any of their work, and that is, frankly, a crime. As such, today we’re going to talk about Parker’s short fiction anthology, ‘Academic Exercises’ – which doesn’t require any knowledge of existing series to read through, and is, not to give the game away, really rather good. This collection includes ten pieces of short fiction and three essays. I found the quality of the stories uneven: some were exceptional ("Let Maps to Others,""The Sun and I," and the remarkable "A Small Price to Pay for Birdsong"), others enjoyable enough but by themselves nothing special. Except … well, except that in this case the whole is greater than the sum of its parts. The characters in these stories face moral and ethical dilemmas, challenges to their artistic and academic integrity, reap This collection includes ten pieces of short fiction and three essays. I found the quality of the stories uneven: some were exceptional ("Let Maps to Others,""The Sun and I," and the remarkable "A Small Price to Pay for Birdsong"), others enjoyable enough but by themselves nothing special. Except … well, except that in this case the whole is greater than the sum of its parts. The characters in these stories face moral and ethical dilemmas, challenges to their artistic and academic integrity, reap the unexpected consequences of good (and bad) intentions, betray, are betrayed ... so that, in combination, the stories add up to a brilliant exploration of all these themes and how each relates to the others. In the process, Parker introduces a varied cast: philosophers, alchemists, academics, and magicans; rogues, confidence men, and opportunists. There are no answers here, only ambiguities and bitter ironies. The convolutions of the longer stories (each with several twists before the end) can be hard to follow, but are ultimately worth the effort. I've noted before that K.J. Parker is a formulaic writer. He approaches each story with almost exactly the same blend of irony, fatalism, and humor. All his stories and novels have the same general feel. He gets away with it because it's an effective formula, and because there's just enough that's new to maintain our interest. He also introduces substantial and thorough background information. This collection contains the first non-fiction I've seen from Parker - detailed essays on siegecraft, armor, and weaponry. They echo the detail that comes through in his stories, and confirm that Parker has dug deeply into his topics; he's not just looking things up on Wikipedia. The stories work, in my view, better than the novels, because they provided more variability in setups and characters. The tone is consistent, but the scenery is more interesting. We also get some insight into the fairly vague magic system Parker has used in several pieces, and into the geography of Parker's vague shared world. A Small Price to Pay for Birdsong - largely because it deals with music, which is a bit of a change for Parker. Amor Vincit Omnia - because it digs a little deeper into the magic system the stories follow. The Sun and I - the most fully developed characters of the set, and an interesting look at the backstory to some of the other pieces. Amazing short fiction and nonfiction collection by one of my favorite fantasy writers. Unlike most short story collections this one isn't uneven at all; every story is engaging and challenging. The stories are mostly set in the vaguely shared Renaissance fantasy universe Parker has created, but without much reference to any specific events in other books, so everything stands alone nicely. As the title suggests, most of the main characters in these stories are scholars and academics, and the sto Amazing short fiction and nonfiction collection by one of my favorite fantasy writers. Unlike most short story collections this one isn't uneven at all; every story is engaging and challenging. The stories are mostly set in the vaguely shared Renaissance fantasy universe Parker has created, but without much reference to any specific events in other books, so everything stands alone nicely. As the title suggests, most of the main characters in these stories are scholars and academics, and the stories tell of how they use and abuse their learning. Reading through this anthology by one of my favourite writers and I'll try to keep my thoughts on each story/essay up-to-date as I go. I've read a couple of the longer ones before, but I might reread them because, well...Parker. Duh. The first of two winners of the World Fantasy Aw Reading through this anthology by one of my favourite writers and I'll try to keep my thoughts on each story/essay up-to-date as I go. I've read a couple of the longer ones before, but I might reread them because, well...Parker. Duh. The first of two winners of the World Fantasy Award for best novella in this collection and it's easy to see why it a) Won and b) was chosen to open the anthology. It's a remarkable piece that really manages to boil down Parker's style; thematically well-rounded and thought-provoking, while remaining funny and philosophical. The narrator is, as always with Parker, both a fantastic character and a literary device. I think perhaps most interesting for me in this story was what seemed the obvious homage to another (in)famous short story, Edgar Allan Poe's The Tell-Tale Heart. Though Parker remains unique throughout, of course. Really superb and completely deserving of its WFA. Weirdly, this was actually my first exposure to Parker. I read it originally a few years back in the Swords and Dark Magic anthology and it made a big impression. On rereading it’s certainly not Parker’s best (hard to imagine it could be!) but it’s a very fun story that uses magic (something Parker almost never does or even alludes to) and even has zombies. Parker’s zombies, that is. It’s even a bit wacky, and again has a narrator who is very much central to the narrative, rather than a passive cypher. I’d love to see more of Parker’s magic in the future, even though there’s no such thing… All in all a good breather after the intensity of A Small Price to Pay for Birdsong, and it also has a cracker of an ending. Perhaps the most directly ‘academic’ story so far – despite Birdsong actually featuring an academic – Amor Vincit Omnia (‘Love Conquers All’) is also one of the stranger Parker stories I’ve read. There’s less deception involved (at least between POV and reader) and instead Parker is more intent on showing off the pointless nature of academia. There’s some action, humour and lots of latin-ish stuff in here. It’s one of the more awkward Parker stories I’ve read, but luckily it is placed brilliantly in this anthology. With the foundations of Parker’s world’s academia and ‘magic’ laid down in the previous two stories, this one resonates a lot more than it would reading it cold. This is the first of three essays in the collection, and it’s a mighty fine (and typically Parker-esque) look into the basic history of military sieges. There was lots of stuff in here I’d never really considered before, and some really nice little factoids. It’s all tied together by Parker’s very natural scholarly prose – not excluding her knack for irony. I would happily pay for more of Parker’s non-fiction, and for all we know there may just be lots more out there. This may just be my favourite of Parker's novellas. The voice is easily as strong as that of the main character in Blue and Gold, but there is a lot more substance in the plot. It has all the Parker staples: snarky MC, holier-than-thou scholars, dark humour, a clever structure, a slow-building plot that gets more and more tangled in its own web and a really quite deep exploration of many things, like academia, exploration and economics. It's probably the best starting point for reading Parker (along with perhaps The Folding Knife and A Small Price to Pay for Birdsong) as it's quite substantial at around 75 pages and incredibly satisfying with an ending that really pays off. Brilliant stuff. A bit Parker-lite this one. The story is interesting enough - and it includes that oh-so-rare thing: Parker magic. In fact, this story acts almost as Parker's treatise on his magic system, introducing us to the concept of 'Rooms' that act as physical-mental conduits between reality and magic. Conceptually its interesting and well executed, and there's a nice twist in there, but ultimately this is just a bit 'lesser' when read against the likes of Let Maps to Others or Purple and Black. Essay no.2, and once again Parker knocks it out of the park! I would read a whole book of these. It's an authoritative look at the history of swords and their uses in different cultures (and indeed, their ultimate 'usefulness'). It's just as snarky as you'd expect from KJP, and genuinely made me think about some of the things I take for granted in reading a lot of fantasy fiction. Interesting story, if a bit confusing. Parker returns to the teacher/pupil dynamic of A Room with a View, with quite a similar pair of characters. The narration jumps around between them and a third party. There's a bit more on Parker's magic system here (sidenote: I'm curious if it will come up in a future novel, because it's really well conceived) and it's one of Parker's more sinister stories. Indeed, I'd go as far as to say it's almost straight-up horror. I wasn't convinced by this one, but it might reward rereading. I've read this novella before in its previous Subterranean Press edition, and reviewed it on my blog. In short I thought it was outstanding and one of Parker's best. Purple and Black is an epistolary novella that focuses on the war dispatches sent between an emperor and his general in the field. For each entry there is a short, official military dispatch written in purple ink; but next to it – written in black ink (duh) – are the less official personal dispatches between these two old friends. As ever, Parker’s writing is top-notch and clever to the point of annoying for any other writer out there, and slowly reveals both the world, relationships and underlying conspiracies behind the dispatches. Superb stuff. Another great essay from Parker here that looks at the realities of creating, developing, using, and in some cases 'perfecting' armour throughout the centuries. I think there was maybe a little less of Parker's trademark snarky wit in this one, though it was certainly evident in the footnotes. Again, really informative and, essentially, and academic essay that reads like it's written by someone with a sense of humour and an eye for being entertaining - something most academics don't really aim for. Wow wow wow, what a great story. This is right up there with A Small Price to Pay for Birdsong and Let Maps to Others - an absolutely terrific novella, I'm surprised that it didn't garner Parker another WFA, or at the very least a nomination. This is KJP on organised religion and man alive he does not hold any punches. A group of con men decide to create God and through a series of coincidental and lucky (or are they...) events quickly rise to be the prominent 'religion' of the world: The Invincible Sun. Yes, this is essentially Parker's creation myth, The Invincible Sun being a deity that pops up in almost every story or novel he has written. Narrated by another unreliable character, this is truly superb writing that I highly recommend anyone interested in Parker gives a shot. Definitely one of the better shorter stories by Parker, though it is hard to get away from the fact that he seems to work at the peak of his powers on novellas in that sweet spot of around 15k-30k words. Blue and Gold is essentially Parker taking the whole device of using an unreliable narrator and doing his absolute best to twist it and play with every possible trope. Saloninus, a character we seem to have heard of in previous stories as some sort of historical figure, is easily the most devious of Parker's creations, telling the reader almost immediately that he is a liar and a cheat. This is probably the most outright 'fun' of Parker's novellas and a good one to end the anthology on, if only because its final line is one of the most devious I have ever had the pleasure to read. Well, I've dipped in and out of this anthology over the last year or so, reviewing each story as I did so. If it isn't clear on reading my thoughts above, I'm an enormous fan of K.J. Parker, and this anthology is exactly the reason why. It is a seminal collection of fiction by one of the best writers out there right now, in any genre. His essays in this collection are hilarious and informative. His short stories are each unique and particularly in this format it is easy to see the development of his 'world' as the anthology plays out. I don't know anything about KJ Parker but he can really spin a good story. The humor is decidedly dry, with a good amount of tongue-in-cheek observations. I really enjoyed it. This collection of stories centers around people in academic situations (research, experiments, teaching, etc), but most of them seemed to be set in an alternate history where there is a type of "science" that really is a form of magic. Perhaps an alternate Byzantine period. There was also a really interesting section on t I don't know anything about KJ Parker but he can really spin a good story. The humor is decidedly dry, with a good amount of tongue-in-cheek observations. I really enjoyed it. This collection of stories centers around people in academic situations (research, experiments, teaching, etc), but most of them seemed to be set in an alternate history where there is a type of "science" that really is a form of magic. Perhaps an alternate Byzantine period. There was also a really interesting section on the history and development of armor, and the history and development of the sword, both of which I found fascinating (and I admit that I am one of those sword enthusiasts who owns one simply so he can cut a plastic jug full of water). Anyway, really a great collection of short stories. About a young protege who is a genius at creating music, which his professor labors at. The professor ends up passing off one of the songs as his own and struggles with knowing he could be found to be a fraud. An "field magician" out hunting what is essentially an undead. Actually suspenseful and enjoyable. Is there really such a thing as invincibility, and has someone unknowingly discovered it, rendering them unstoppable? Just like it sounds. The history of sieges, very informative. An academic who researches a lost island, piecing together fragments of information and guesswork, forges a document to replace one that was lost, yet verifies his research. The prince asks him to accompany him on an expedition to find it. A neat exercise in academic integrity and fear of being found out. On swords. Absolutely fascinating and informative. The discovery of how to transmit a person's entire knowledge to another, with the consequences. Creepy. A collection of "letters" back and forth between two friends, one just become emperor, the other made general. Absolutely brilliant insight into the difference between ideals and reality. Loved it. History of armor. Really interesting and informative. A group of con-men start a new religion, only to find out that it's true...retrospectively at least. This collection of short stories starts with the brilliant "A Small Price to Pay for Birdsong." A young composer, a genius, comes to his professor, the narrator, a career academic whose music lacks "wings." In exchange for help escaping the police, he offers a symphony that the professor can represent as his own. It is a joy to watch the exchange shape both lives. Each story in the collection is in some way memorable. Each features entirely different characters, but is recognizably set in the sam This collection of short stories starts with the brilliant "A Small Price to Pay for Birdsong." A young composer, a genius, comes to his professor, the narrator, a career academic whose music lacks "wings." In exchange for help escaping the police, he offers a symphony that the professor can represent as his own. It is a joy to watch the exchange shape both lives. Each story in the collection is in some way memorable. Each features entirely different characters, but is recognizably set in the same world of magic, money, and the worship of the Invincible Sun, and they arise from interesting questions. How would one's psychology be affected if his magic made him perfectly impervious to all harm, physical or psychic? Can an enlightened individual be emperor? How is reading similar to being possessed? Might your hoax accidentally turn out to be true? Also included are three non-fiction essays on the social history of siege warfare, swords, and armour. Set among the fiction, they have a strange impact that would be lost if they appeared alone. K.J. Parker is a relatively recent discovery of mine, and she (?) is quickly becoming one of my favorite authors. Known for her dry cynicism, understated humor, and intriguing explorations of morality, her stories are set in a historically informed world fleshed out with Parker’s rich historical knowledge. Collected here in her first anthology, Academic Exercises, her short fiction has so far won two World Fantasy Awards for her novellas “A Small Price to Pay for Birdsong” and “Let Maps to Others K.J. Parker is a relatively recent discovery of mine, and she (?) is quickly becoming one of my favorite authors. Known for her dry cynicism, understated humor, and intriguing explorations of morality, her stories are set in a historically informed world fleshed out with Parker’s rich historical knowledge. Collected here in her first anthology, Academic Exercises, her short fiction has so far won two World Fantasy Awards for her novellas “A Small Price to Pay for Birdsong” and “Let Maps to Others.” Included in this anthology are also three non-fiction essays on historical subjects such as siege warfare, and the history of swords, and armor. Definitely a solid collection, and I appreciate that almost all of it was novella length, but unfortunately Parker's stories are too similar for 500 pages, especially how they're all set in the same academic environment with relatively similar narrators. My favorites were "A Small Price to Pay for Birdsong," "Let's Map to Others," and the three essays on the history, social politics, and technology of siege warfare, swords, and armor. This kind of fascination with detail and engineering is a big Definitely a solid collection, and I appreciate that almost all of it was novella length, but unfortunately Parker's stories are too similar for 500 pages, especially how they're all set in the same academic environment with relatively similar narrators. My favorites were "A Small Price to Pay for Birdsong," "Let's Map to Others," and the three essays on the history, social politics, and technology of siege warfare, swords, and armor. This kind of fascination with detail and engineering is a big element of Parker's work, though it's also brilliantly written and constructed. But yeah, there's just not enough variety in this collection, though I'm sure I'll read one of Parker's series eventually, since the writing is excellent and I love how solid it all feels. Academic Exercises is a collection of novellas by K.J. Parker. There's a range of topics featured in the book, dealing with various arts, religion, magic, war, and even some non-fiction work which covers siege warfare, swords and armour. Although classified as a fantasy, it's not the typical worlds with imaginative creatures and magic spells. Instead, the humans which are gifted in magic don't see themselves as wizards, but as philosophers, specialising in mental energies. They often use these po Academic Exercises is a collection of novellas by K.J. Parker. There's a range of topics featured in the book, dealing with various arts, religion, magic, war, and even some non-fiction work which covers siege warfare, swords and armour. Although classified as a fantasy, it's not the typical worlds with imaginative creatures and magic spells. Instead, the humans which are gifted in magic don't see themselves as wizards, but as philosophers, specialising in mental energies. They often use these powers to exorcise demons. Most of the stories deal with similar characters, ones with personal failures which lead them into immoral situations. There's probably something wrong with you if you like KJ Parker's books. I'm sorry, but there it is. Another fine example of how even the fictional history of a fantasy world is a series of blunders, lies, and crimes against humanity. In case you were having day with too much sunshine, a lottery win, or a fine time with friends, this collection of short stories and essays will depress you enough that you will no longer secretly feel something bad will happen to you, because it already has. Reall There's probably something wrong with you if you like KJ Parker's books. I'm sorry, but there it is. Really liked every story in this collection (there are also three reasonably entertaining essays--on swords, armor, and sieges--included). Four stars rather than five mostly because Parker's story structure seems so consistent. Not predictable in the details, but ultimately fairly homogeneous on the whole. Still, I enjoy the clockwork plots, clever, morally ambiguous (well, generally morally deficient to some extent) protagonists, and spare, sharp prose each time. I also enjoyed getting a bit mor Really liked every story in this collection (there are also three reasonably entertaining essays--on swords, armor, and sieges--included). Four stars rather than five mostly because Parker's story structure seems so consistent. Not predictable in the details, but ultimately fairly homogeneous on the whole. Still, I enjoy the clockwork plots, clever, morally ambiguous (well, generally morally deficient to some extent) protagonists, and spare, sharp prose each time. I also enjoyed getting a bit more history of the world shared by some of Parker's novels (The Folding Knife, The Company, The Hammer). Fans of KJ Parker will love this collection of the author's shorter fiction. If you're not a fan of KJ Parker already, this will serve as a strong introduction to the author's style, tone, obsessions and techniques. For those of us who are fans, these 500 pages are full of what we've come to love. Acerbic wit, wildly interesting descriptions of magic systems, crackling dialogue, completely believable characters in settings that breathe with life. A remarkable collection. All were good and some were great. The opener, A Small Price for Birdsong, in particular was terrific and ably set the tone for the rest. I also enjoyed the essays on Weapons and Armour. Informative as well as entertaining. In addition, the stories provided some tantalizing glimpses of the shared history and mythology Parker has established. I would really like to see a map and a time line of all the novels and stories. Quite a collection of scoundrels & scholars, often in the same man. Can't get enough Parker lately. After this I'm very keen to get to some of his novels--I hope they're as funny, bleak, and human as his short stories. Yeah, so, turns out my opinion on this book was already said far better by Foz Meadows. One star for Birdsong, and a big wet you're-a-giant-sexist-douche,-book raspberry for the rest. Ahlak üzerine bir öykü derlemesi denebilir. Sihirli bir dünya değil ama fantastik. Güzel yanı her öykü iyi ile kötüyü sorguluyor. Çok başarılı. Not generally a fan of short fiction, but Parker's voice and sense of humour suit me perfectly. The few essays scattered through the collection are quite enjoyable as well. A Humble Bundle purchase, another ebook that justified this excellent way of picking up interesting books! This book is different from any that I have read before. As others have stated, accurately, it is a collection of short stories and novellas which all take place in a similar world, but also mixed in are three well constructed and argued treatises on aspects of medieval warfare (sieges, sword and armour technology). Putting aside the non-fiction portions for the time being, the stories are a A Humble Bundle purchase, another ebook that justified this excellent way of picking up interesting books! Putting aside the non-fiction portions for the time being, the stories are all set in a reality which seems to be at a technology level approximating to somewhere between 1500-1750AD. The political structures sound like the sort of city states that could be managed in a horse based transport infrastructure, the academic structures (the Studium, a neoligism I really liked) sound like a medieval University which teaches theology alongside sciences. The last story, centred on the activities of a rogue alchemist really helped with this feeling, with lots of old time chemical names which I could decode or understand from my own modern chemistry training. The fantasy elements in some of the stories revolved around the adepts trained by the Studium, who were capable of feats of magic science involving being able to use different 'rooms' to transcend reality and travel between places instantaneously, or check dogs for demonic possesion. As always with collections of short stories, there was some variance in how well each story worked, but having them tied together in a single reality meant that those stories which weren't quite as good as others still managed to be a part of a larger whole, and therefore worth the effort. The non-fiction sections were short discussions of practical aspects of medieval warfare. The first time I hit one I expected it to be a feed into a story which played on the information that had been imparted, but there are no stories which feature any of siege, swords or armour. However, I found these three dispassionate discussions felt like enjoyable interludes breaking up the stories. “Academic Exercises” compiles some of K. J. Paker’s most popular short stories and novellas. If you’re already a fan of K. J. Parker, as it was my case before reading this book, you’ll probably know most of these pieces, but that’s not a reason for not reading this collection, as most of the stories are so brilliant that you’ll enjoy them as much as the first time. If you’re new to this author, this is the perfect starting place as you’ll find here most of his best, most awarded and representative short fiction. K. J. Parker’s stories are a pleasure to read. They’re intelligent, witty, funny, sometimes even hilarious, and deeper than what they may seem at first sight, as they abound in incisive remarks about plenty of crucial issues (power, politics, religion, art… among many others). My only drawback is that as most of the stories have a similar setting, tone, narrator’s voice and style, so they may seem a bit too similar if read at a single sitting. They’re definitely better enjoyed reading one at a time. I’d also like to highlight the three historical essays about swords, sieges and armors, which are as enjoyable as any of the fiction pieces. This is without any doubt the best collection (and one of the best books of any genre) I’ve read so far this year. Highly recommended. I'm going to summarize my impressions of the stories in this collection as I go along, knowing full well that by this time next year, those impressions will be all that's left. K.J. Parker is a pseudonym for Tom Holt. According to the biographical notes in some of Parker's books, Parker has previously worked in law, journalism, and numismatics, and now writes and makes things out of wood and metal. It is also claimed that Parker is married to a solicitor and now lives in southern England. According to an autobiographical note, Parker was raised in rural Vermont, a lifest K.J. Parker is a pseudonym for Tom Holt.